In order to show the value in millimeters of a length in the exponent, you must access the Project Preferences dialog box from the Project Settings toolbar. Go to the Drawing annotation tab and check the "mm in exponent" option. After checking this option, all lengths will be represented with the millimeter value in the exponent. The display of lengths is affected by this option, including altitudes. You may need to use the "mm in exponent" option for several cases, but you may also find it less useful in the case of slab altitudes. To keep the option active and yet to get a non-exponential representation of mm in the slab symbol, you must change the slab symbol altogether. From this folder, open Cota Placa.dwg with AutoCAD®. Next, you must change the text from to . This will allow the program to discard the mm in exponent function on that symbol. 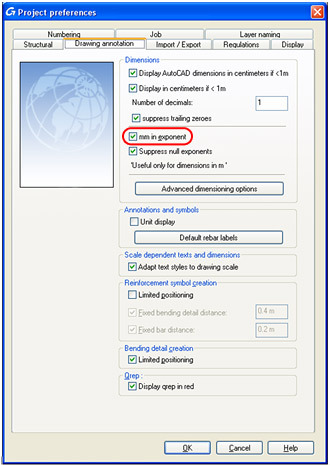 After the changes have been made, the drawing must be saved in the AutoCAD® 2000 format in the same folder. After saving the symbol template, with the "mm in exponent" option active, you can create slabs with non-exponential millimeter values in the symbols. Note that none of the other lengths are affected by this modification.